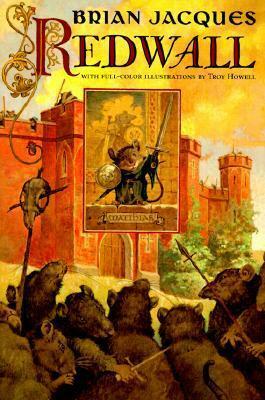 Redwall is the beginning of a series teeming with riddles, humor, unforgettable characters, and high bounding adventure. What can the peace-loving mice of Redwall Abbey do to defend themselves against Cluny the Scourge and his battle-seasoned army of rats? If only they had the sword of Martin the Warrior, they might have a chance. But the legendary weapon has long been forgotten – except, that is, by the bumbling young apprentice Matthias, who becomes the unlikelies of heroes. Brian Jacques was born in Liverpool, England on June 15th, 1939. Brian grew up in the area around the Liverpool docks, where he attended St. John's School, an inner city school featuring a playground on its roof. At the age of ten, his very first day at St. John's foreshadowed his future career as an author; given an assignment to write a story about animals, he wrote a short story about a bird who cleaned a crocodile's teeth. Brian's teacher could not, and would not believe that a ten year old could write so well. When young Brian refused to falsely say that he had copied the story, he was caned as "a liar". He had always loved to write, but it was only then that he realized he had a talent for it. He wrote Redwall for the children at the Royal Wavertree School for the Blind in Liverpool, where as a truck driver, he delivered milk. Because of the nature of his first audience, he made his style of writing as descriptive as possible, painting pictures with words so that the schoolchildren could see them in their imaginations. He remained a patron of the school until his death. Brian lived in Liverpool, where his two grown sons, Marc, a carpenter and bricklayer, and David, a professor of Art and a muralist, still reside. Brian also ran a weekly radio show on BBC Radio Merseyside, until October 2006, where he shared his comedy and wit, and played his favourites from the world of opera - he was a veritable expert on The Three Tenors. When he was wasn't writing, Brian enjoyed walking his dog 'Teddy', a white West Highland Terrier, and completing crossword puzzles. When he found time he read the works of Mario Puzo, Damon Runyon, Richard Condon, Larry McMurty, and P.G. Wodehouse. He was also known to cook an impressive version of his favourite dish, spaghetti and meatballs. Sadly, Brian passed away on the 5th February 2011.